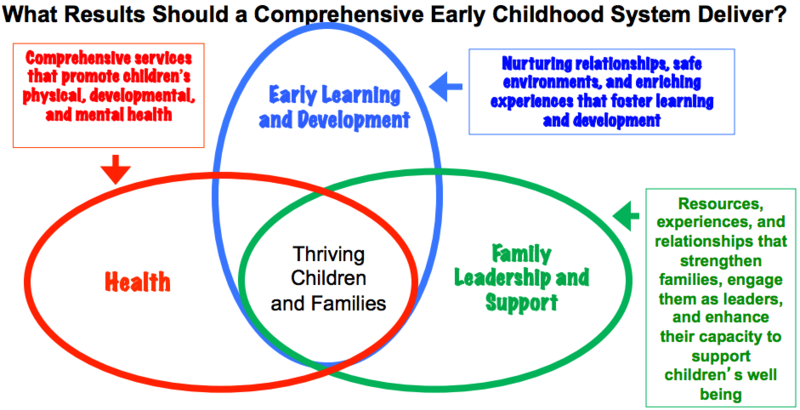 The early childhood system in Illinois is complex and includes early learning, health and mental health, and family support and engagement programs. When it comes to making sure every child is fully ready for school, communities often face a variety of complex issues that are not easily addressed with simple solutions or solved by one organization alone. That’s why it is important to move beyond building solutions through individual programs. When multiple agencies, organizations, and families work together, the available resources become more substantial and provide greater benefits that the community as a whole can utilize and further build collective power to influence systems and create social change. Improving the outcomes for young children and families requires bringing together organizations, schools, and community leaders to develop a shared agenda, design strategies, and develop an action plan to address the systems barriers and conditions that prevent families from accessing early childhood services. In Illinois, we refer to this collaborative process of bringing together stakeholders to develop coordinated and integrated local early childhood service delivery systems as community systems development. Community systems development encourages communities to come together to discuss issues in their community using systems thinking approaches to identify the issues, the root causes, and the solutions – such as analyzing data, looking at trends and patterns, and thinking critically about what or why an issue persists. Community systems development relies on building strong, trusting relationships with community stakeholders to meaningfully understand issues in the community and to engage people directly impacted by services in conversation to understand, identify, and solve issues. This website offers resources for local early childhood collaborations to develop 'partners,' 'plan' together, and 'act' on your vision and ideas to achieve positive outcomes for young children and families.